Start making more informed decisions about your site. Use Query Monitor to measure and improve your sites performance. John Blackbourn, the plugin’s author and WordPress core contributor, will show you how! 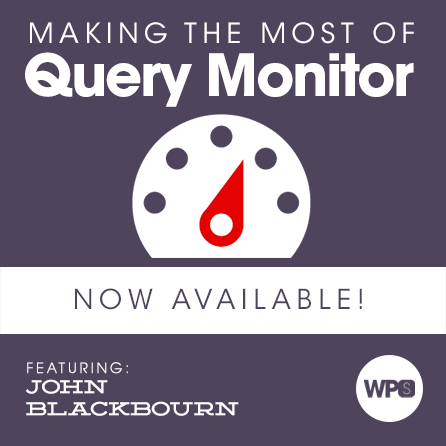 In this incredible session, John Blackbourn will walk you through all of the tremendously useful things you can do using his ever-popular Query Monitor plugin. We’re going to talk about the many different bits of useful information it provides along with some great, practical ways you can leverage that data to make informed decisions. Are you working with a slow WordPress site? Query Monitor helps you understand why. Do only certain pages give you trouble when others work just fine? Query Monitor gives you reports so you can identify the underlying issue and solve the problem correctly the first time. Query Monitor does a number of things extremely well, and John has been quietly working on expanding the feature set to become even more useful. During this session you’ll be among the first to see what the future holds for Query Monitor so that you can begin thinking about even more ways you can improve upon your site. This session pairs perfectly with Zack Tollman’s Performance and Optimization course. If you’re a VIP Member I highly suggest you watch that one as it gives excellent detail on additional ways you can measure and improve upon your site’s performance. Not convinced that performance is important? Let Aaron Jorbin walk you through exactly how important performance is to the bottom line of anyone doing business on the internet (hint: every 200ms delay can translate to hundreds of thousands in lost revenue per year) in our Performance Driven Development session. How does Query Monitor work?